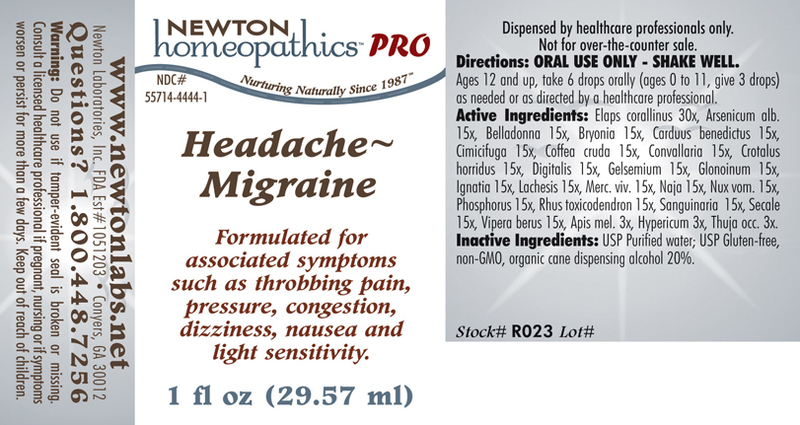 HEADACHE - MIGRAINE Formulated for associated symptoms such as throbbing pain, pressure, congestion, dizziness, nausea and light sensitivity. Directions: ORAL USE ONLY - SHAKE WELL. Ages 12 and up, take 6 drops orally (ages 0 to 11, give 3 drops) as needed or as directed by a healthcare professional. Elaps corallinus 30x, Arsenicum alb. 15x, Belladonna 15x, Bryonia 15x, Carduus benedictus 15x, Cimicifuga 15x, Coffea cruda 15x, Convallaria 15x, Crotalus horridus 15x, Digitalis 15x, Gelsemium 15x, Glonoinum 15x, Ignatia 15x, Lachesis 15x, Merc. viv. 15x, Naja 15x, Nux vom. 15x, Phosphorus 15x, Rhus toxicodendron 15x, Sanguinaria 15x, Secale 15x, Vipera berus 15x, Apis mel. 3x, Hypericum 3x, Thuja occ. 3x.